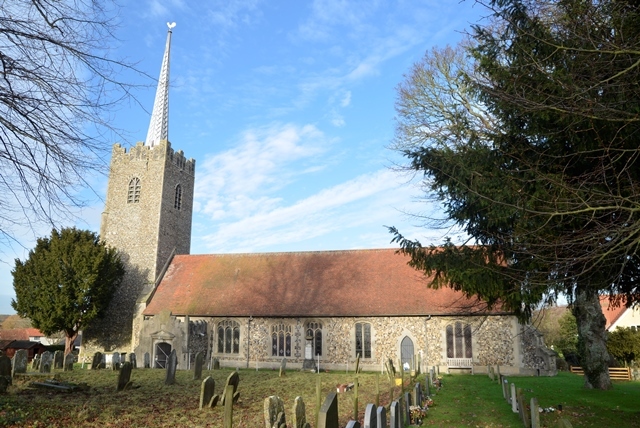 With bed and breakfast guests from 27th December, I decided to book a short break to visit churches in the week before Christmas. It felt a little risky to book 3 nights away several weeks in advance, not knowing what the weather would be like. But, bar any blizzards, I knew that if I committed myself by paying for accommodation, I would go, and enjoy it even if the churches were freezing. And if they were really too cold, I could spend more time walking and writing instead. So I found and booked the loft of someone’s outbuilding in Westleton, near the coast and a good area for both walking and churches. I was lucky with the weather: it was mild, with more than a fair smattering of sunshine. For the second time this autumn, however, my trip was preceded by an animal disaster which meant that I left home both with a heavy heart, angry with myself and doubting my competence, and feeling that distraction and having a break away from home would do me good. 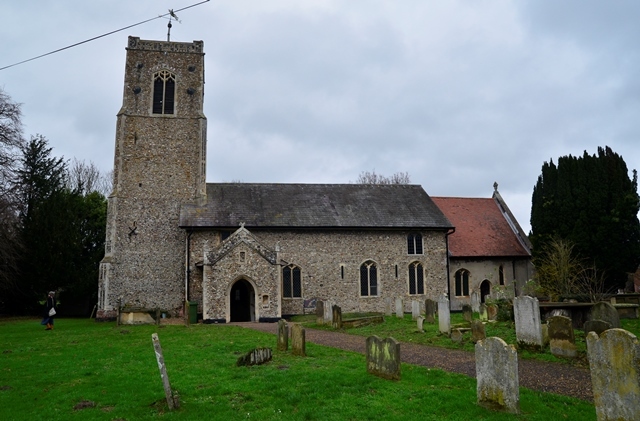 I had made a Saturday morning appointment with Steve, a bassoonist with whom I had played recently in two orchestral concerts, to visit his village church. I had first met him a year or two previously in his official capacity as a woodwind instrument repairer: I went to his house to meet a friend of mine, Joost, who had just come up on the train from London to drop off his bassoon at Steve’s house. Joost had raved about both Steve and his vegetable garden, and had asked if I could have a tour. I was kindly invited to coffee and cake as well. His vegetables were indeed impressive, as was his baking, and he was quite as friendly and lively as Joost had led me to believe. So, when we met again, we quickly got chatting about all sorts of things, including, of course, churches. I was delighted when he offered to join me at Stutton church, and I was impressed that he was up for the challenge of church playing at this time of year: any rural musician will be partially used to playing in cold churches in the run up to Christmas, but I think not many would choose to do so just for the fun of it. I was back on the east coast the following weekend for a concert at Snape Maltings. 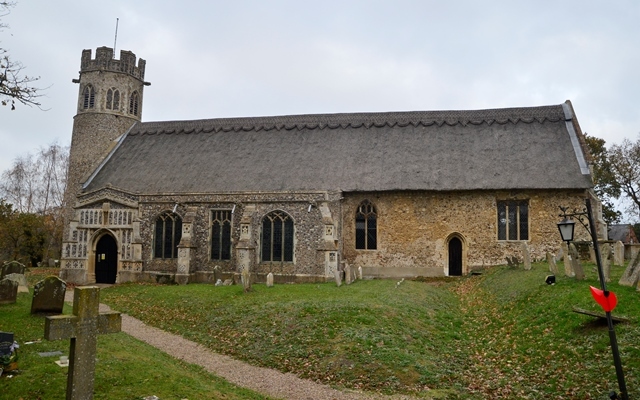 My friends in Sibton Green kindly offered me a bed again to spare me a late drive home after the Friday night rehearsal, so I had the luxury of a whole morning on Saturday to explore. 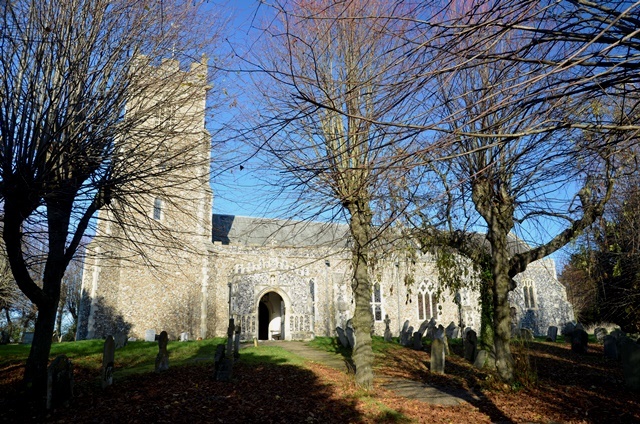 Heading towards Aldeburgh to visit a friend for late morning coffee, Theberton lay along my route. I had a treat in store. 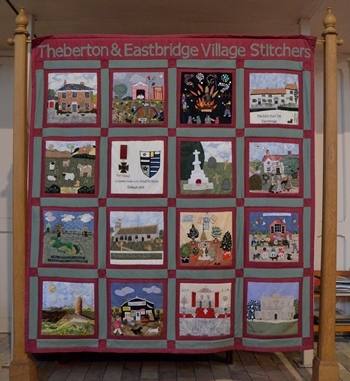 Its round tower and thatch were only the beginning: inside, I found an impressive hanging quilt made by the ‘Theberton and Eastbridge village stitchers’, showing scenes of village life. I turned right to walk towards the chancel and saw that the south aisle and its columns were painted. I read afterwards that this painting dates from the 1846 rebuilding of the south aisle1. While I admired it, however, I didn’t really question its age or design, I simply thought how cheerful and bright it made the already lovely church. The following morning, after a blissful night’s sleep in the epitome of rural Suffolk cottages, I went for a walk in the sunshine and then set off in the direction of Saxmundham. 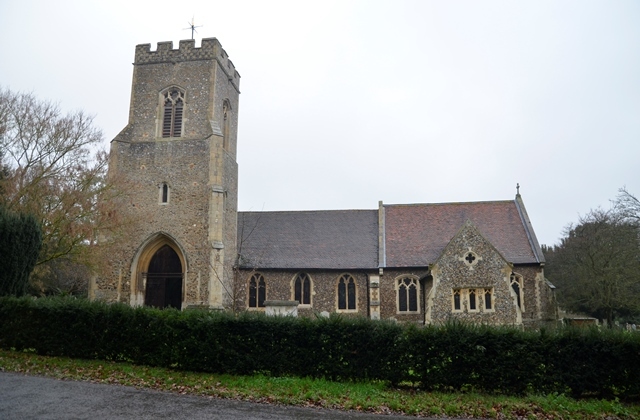 Before the afternoon concert in Darsham church, I was due at Aldringham Court nursing home at 2pm to play to the bed-bound elderly mother of an acquaintance, and I intended to fit in two churches on the way. Although all the music I was playing today I had played before, I hadn’t spent quite long enough on them lately to feel comfortable performing them, so I was glad of some practice time. 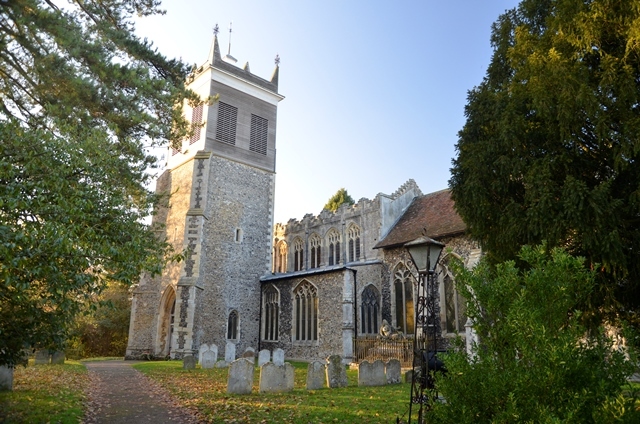 It was the weekend of the CelloAid concert in Darsham church: an all-cello concert, all ages and all standards, in aid of Suffolk Refugee Support. I was heading to Sibton Green the day before for a rehearsal, and had arranged to spend the night there with friends, as Darsham was only a few miles away. 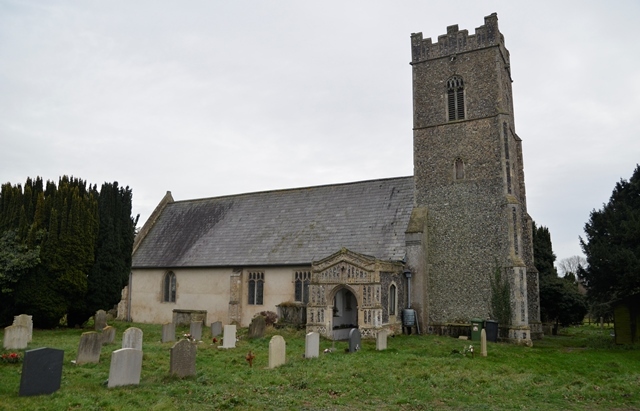 I had driven past the ‘church open’ sign outside Stonham Aspal church many a time on my way coastwards. The sign seemed the most enticing thing about it: the church was tucked back behind some trees, looking rather cramped and dark in the middle of the village. Driving past west to east, its tower was invisible to a car driver, so that I didn’t realise it had one until I stepped into the churchyard.